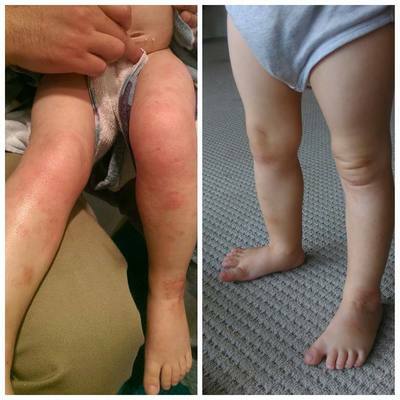 My 2 year old son suffers from eczema, and has from the age of 4 months. Anyone with eczema will know, it's horrible. During an eczema flair-up, there is little relief, which is very distressing for a child and parent. In a moment of despair, a childcare worker suggested I try salt treatment for my son's condition. I'm open to anything non-invasive, so gave it a shot. After a little research, I found Dr Salt in Hampton. Dr Salt offer natural salt therapy rooms for adults and kids. I booked my son in for salt treatments over six sessions. Salt therapy, otherwise known as Speleotherapy, is a holistic way to treat ailments. Therapy, means patients sit in a room filled with salt. The walls and ceilings are made up of salt brick, and the floor is loose salt rock. Salt therapy uses the natural minerals and properties found in salt, which help to improve congestion and relieve symptoms associated with respiratory and skin conditions. Tiny salt particles are inhaled by the patient, which kill off the micro-organisms that cause infections. More information can be found here. Dr Salt in Hampton are incredibly supportive and helpful. At the first appointment, I completed a form and we talked through my son's health concerns in a 10 minute consultation. 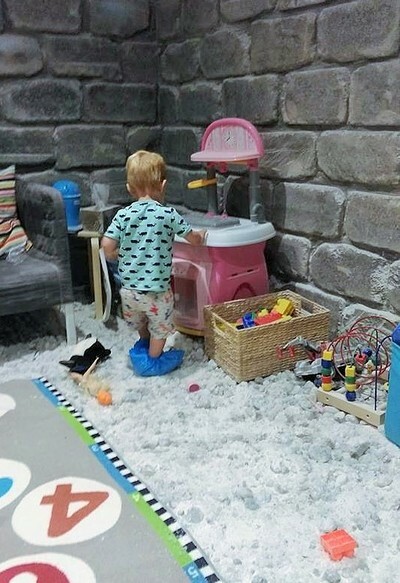 We were given blue plastic shoe cover-ups to wear, which my son didn't like to start with, although when we saw the salt 'play room' he soon forgot about the his feet. 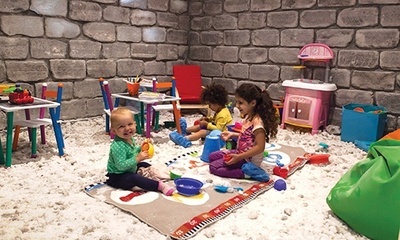 The 'play room' I talk of, is a salt room designed for children. In that room, there are toys, play equipment, colouring books and pencils, as well as books for children's entertainment. My son treated the loose salt on the floor much like sand. He would use buckets and shovels, and pour salt into the tea set to 'make tea'. This is encouraged, because by playing with the salt, it helps release more particles into the air. 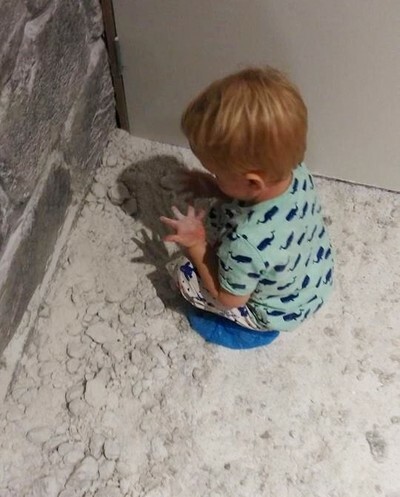 I couldn't really 'see' the salt particles, other than when my son would brush toys with the cleaning dusters - this wasn't an issue when he did. The only time I did notice salt, would be when I licked my lips! 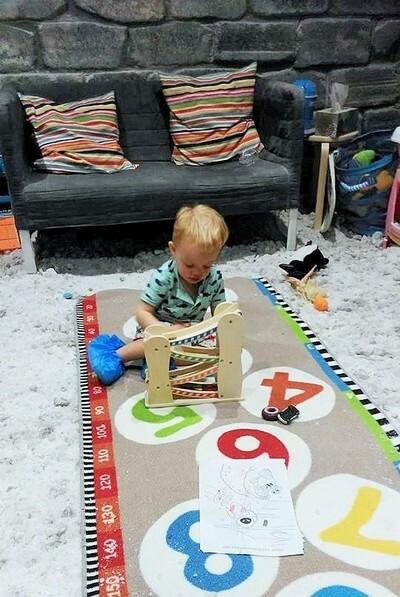 An hour spent in the kid's salt room would pass quite quickly, and my son didn't get bored during any in any of the six sessions. On each occasion, my son and I would talk about a visit to the 'salt play room', so he understood where we were going. The shoe covers became part of the ritual, and no dramas after the first visit. Sometimes we would share the treatment room with another child and parent, other times we didn't. It didn't matter either way really because there are enough toys to share, and the children's salt room is big enough to accommodate a few families. Did salt therapy work for my my son? After six sessions, twice a week, I really think salt therapy improved my son's eczema. I was told to expect his skin to get worse before it gets better, and that's what happened. I also found that his poo after the first visit, was quite toxic! !, which apparently, is a sign of his body getting rid of all the bad stuff. It it suggested that patients continue salt treatment after the first six sessions, to maintain optimum health. At this point, I am going to see how my son goes, but as soon as I see a sign of an eczema flair-up again, I'll be straight back to Dr Salt. Likewise if either of my kids experience prolonged colds or respiratory complaints, I'll book in for an appointment with Dr Salt, too. I can only imagine the benefit an asthma sufferer would have, reports indicate a very positive outcome. Cost: Salt Room Session for both children and adults- $26 - $45.00 per hour. Children under 9 must be accompanied by an adult - adults are not charged while attending with children.